Fish Stocking Harming Wild Fish Populations? When I bought my first fly rod two years ago, the gentleman at the tackle shop asked if I planned on doing some tying as well. I replied saying that wasn’t really my thing. Why would I spend time tying this tiny string around these small hooks, when I could just buy and use them right away? Not to mention the fact that fly fishing seemed so alien to me at the time and adding another layer to it might push me away from the fishing style all together. Well, here I am, two years later with a vice attached to my kitchen table and various feathers, hairs, and fabrics scattered around me. I’m still not a good fly fisherman, but after speaking with other anglers, I have decided to take up the art of fly tying. I went searching for help on various Facebook pages on how to become better at fly fishing, and a lot of people recommended, amongst other things like practicing my casting, to tie my own flies. Their rationale is that this will provide me with a better understanding of the flies, their colurs, and how fish react to them. I’ve tied 5 flies so far and as you’ll see later, I doubt the hungriest trout would find them appealing. I’ve stuck with the staple flies; wooly bugger and wooly worm. Again on the advice of a tackle shop employee, I bought a pack of 25 hooks, hackle, maribou, thread, chenille, and a starter kit with all the tools required to create flies. I was convinced to buy the better tool set because I would outgrow the basic set within a month. I’ve yet to determine if this was truthful or just a good sales technique. I’ve never been a patient person and working with small things has always been a fustration; both of which are essential to fly fishing and fly tying. 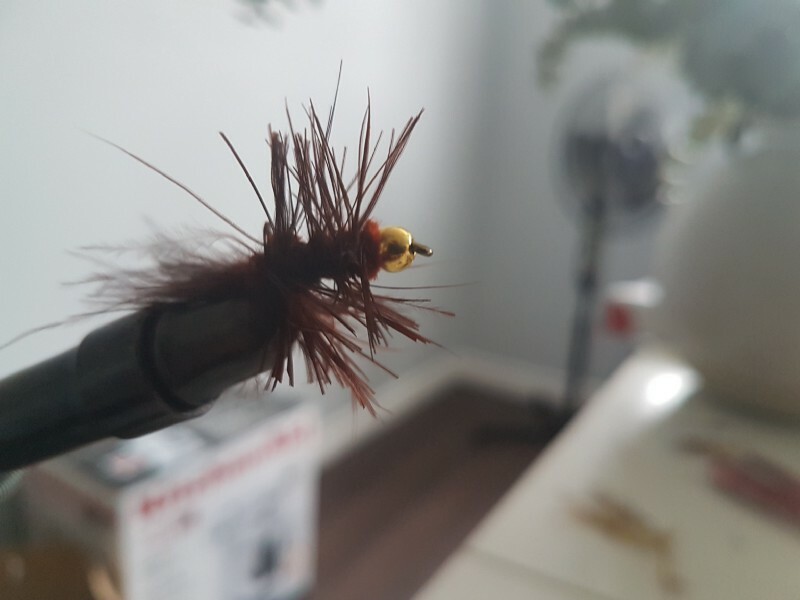 That being said, I have enjoyed my fly tying experience thus far and I am starting to think the people I was talking to weren’t kidding about tying. The real answer will come once one of my creations is deemed edible by a trout. I’ll post pictures of the tied flies below with description of what happened along the way. Of the five that are tied, only three are actually finished and “ready” to fish. Only one will get the honour of being tied on the end of my tippet this spring. This was my first attempt at tying and fly and despite my lack of arts and crafts skills, It came out alright. I didn’t size the tail properly and the hackle feather leaves much to be desired, but overall I was impressed with my first attempt. Thanks YouTube! Yup. If you’re thinking that looks like a collection of fly tying materials randomly tied on a hook, you’d be right. I attempted to follow paper directions that I picked up at the fly shop, and this is what happened. By the end I got fustrated and just cut the thread. Compared to my wooly worm attempt, this fly looks like it was tied by a professional. Even compared to my first attempt, this one shows signs of improvement. The tail doesn’t look like it came from a squirrel, and the hackle feathers look a little better this time around. Still plenty of room for improvement! I don’t know what happened with this one, so we’ll just move on. My best one yet! I decided to give it a go without the bead head this time, and it turned out alright. That’s the best tail I’ve tied on yet and again there is improvement with the hackle teathers. They could be shorter, but that will come with time! Overall, there has been a lot of progress with my wooly buggers, but the wooly worms need some work. 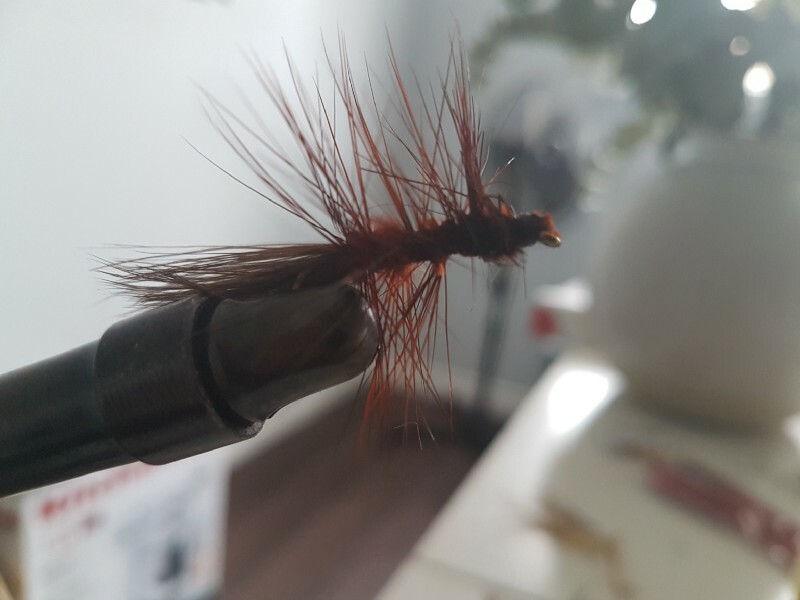 Fly tying is not something I ever pictured myself being interested in doing, but so far I really enjoy it and think I’ll stick with it for a while. It will become even more fun once I start catching fish with my own creations! Soon enough I’ll be back out on the water testing these out to see what works and what doesn’t. If you’re interested in learning how to tie, I recommend you check out the scflytying Youtube channel. His videos have helped me a lot and are the reason I’ve been able to improve my wooly buggers! For as long as I can remember, fish hatcheries have been used to maintain a sustainable amount of fish in the lakes and rivers of Ontario. Hatcheries are usually focused on trout and salmon, but stocking walleye has been utilized frequently as well. When you think about it, putting more fish into these waters would result in higher populations of fish and thus, more catchable fish. I never questioned that idea until last month when I listened to April Vokey’s podcast titled, “Anchored”. Her July 13th podcast featured Dylan Tomine, author and passionate angler based in the Pacific Northwest. His argument is that hatcheries and stocking fish actually ruins fisheries, especially for the wild fish. He mostly talks about the steelhead rivers on the west coast, but he cites cases of rivers in the central U.S. where the same issue has occurred. Tomine stated that “…where hatcheries are introduced, overall harvest and harvestable number of fish goes down”. I heard him say that and thought, “That makes no sense. How does increasing the amount of fish actually result in less fish?” But Tomine goes on to say that the Skagit, a river located in the northwest corner of Washington, had a harvest of around 15,000 steelhead and that lasted for decades. When the hatchery was introduced, the number harvested fish dropped almost equally to the amount of fish that were stocked. One of the biggest reasons for this is the fact that hatchery fish have negative effects on the wild fish. They have to compete for food, habitat, etc. Not only do the wild fish have to compete with the hatchery fish, spawning also becomes an issue. Tomine said that when a stocked fish spawns with a wild fish, the survival rate of the offspring is reduced by 50% in the first generation. If one hatchery male spawns with 20 wild females, a large amount of the eggs laid will not make it. When asked why hatcheries are used, Tomine said that the main idea behind it is to make up for loss of habitat. But he quickly shoots down this arugment by pointing out that in the Skagit, there is a thriving pink salmon, bull trout, and cutthroat trout population. These fish use many of the same spawning grounds and habitat that the steelhead use. Both trout species have either remained level or climbed in terms of their population while the pink salmon population has risen exponentially. So the argument that the hatchery is needed because of loss of habitat is poor. The only difference between the steelhead and the other species is that there are stocked steelhead in the river. Another example given during this podcast was the Eel river, which is located in Northwest California. A hatchery program was started there in 1964 when the fish population was around 82,000 wild steelhead. In 1994, there was 1500 fish, which was both wild and hatchery. In 1994 steelhead were classified endangered, so they closed the hatchery. Prior to listening to this podcast, I would say that closing the hatchery would surely deplete the remaining fish population, but in 2014 the fish population increased to around 60,000. The fish population fell dramatically when the hatchery was introduced, and then did the opposite once it was removed. Tomine says that over the next 10 years, the Eel may be fully recovered to the 82,000 fish. During the 60s and 70s in Montana, there were decreasing numbers of trout in their rivers and creeks. 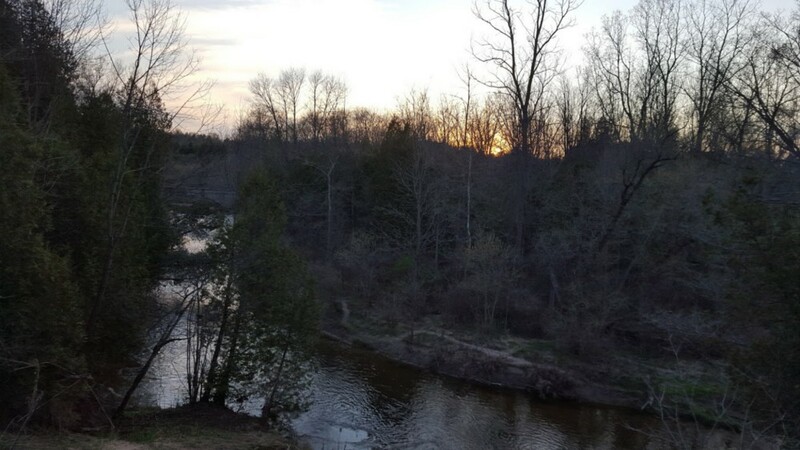 A biologist was hired to determine the issue and what he found was reductions in health and numbers of trout in all locations where hatcheries were present. The Montana government took his report and closed all of their hatcheries in 1974. In 1978, the brown trout population doubled and the rainbow trout population increase by 800%. Both species also increased in size. Montana is now regarded as the best trout fishing destination in all of North America. It took me a while to wrap my head around the idea that putting more fish into the rivers actually harms the population. April and Dylan talk about how this is still a very heated argument in the fishing community and how they have lost friends over this topic. Regardless of which side someone is on, everyone cares about the population of the fish and wants to have sustainable numbers so they can keep catching them. Like most things in life, people all want the same thing, they just can’t agree on the method. After listening to this podcast and doing some research, I think a handful of hatcheries in Ontario should be closed and the population numbers should be studied. If it turns out the same way as the Eel and Skagit, remaining hatcheries should be closed as well. The recovery time can take a while, but if it means we have sustainable populations for generations to come, it would be well worth it. To listen to the Anchored podcast, click the link below. Ask any angler how they got started fishing and 9 out of 10 times they will tell you it was with their dad or grandad. Dads play such an important role in passing on fishing knowledge from generation to generation. It starts out with simple panfishing using a closed faced reel partnered with a worm, hook, and bobber. From there it evolves into some of the harder species like bass and walleye and then maybe you end up fishing tournaments together. Regardless of whether it’s panfishing or competitive bass tournaments, the time you spend fishing with your father will be some of the most cherished memories of both of your lives. Growing up, my dad was never that into fishing. He would dust off the tackle box a couple times a year when we went up north to a cottage, but that was about it. Up until a couple summers ago, he used the same rod and tackle box since before I was born. Both have since been retired, but not without their fair share of stories. My dad’s tackle box is filled with the basics — a couple of spinners, some spoons, a Rapala Floating Minnow (which I think outdates my 25 years), hooks, bobbers, and leaders. I used a similar size box for most of my life, until I really caught the bug and had to upgrade. My dad now uses my old box. I’m not exactly sure what the rod was, but if I had to guess it was a 7 foot, medium power rod coupled with a closed faced spinning reel. It was likely bought from Canadian Tire years ago for a very good price. Until I spent a summer working at a fishing lodge, this rod was responsible for reeling in the biggest fish I ever saw. I was too young to remember what type of fish it was, but Dad still talks about how big it was. We have had some good times fishing together. Like the time I dropped his rod in the water and refused to go in after it. Let’s just say he wasn’t very impressed that he had to dive in after it himself. One of the funnier (and dangerous) moments took place four years ago at a cottage outside of Hunstville. We were fishing down on the dock and Dad was standing to my left. After about 15 minutes of fishing, he went to make a cast and before I knew what happened, I had a Mepps spinner in my left chest pocket. Somehow his cast went around the right side of my body, wrapped around me, and ended up hooked into my red and black plaid jacket. This was, and still is, a cottage attire staple for me, and it now has a slight rip in the chest pocket. Whenever I see it I’m reminded of this story. After it happened, I stood there for a bit trying to figure out how he managed to do that while we, along with the rest of the family on the dock, laughed hysterically. With the exception of weeds, I was the only thing either of us caught during the visit there. I should note that the same thing happened the next day. I now stand at a distance when my dad is casting. For my birthday last year, Dad took me on a charted fishing trip in Lake Erie. Although we only caught two walleye, it was still a great day being out on the water and catching fish with my dad. This trip was only our second time fishing together in a boat. At a cottage in Honey Harbour two summers ago, we had access to a little boat with a 9.9. We took it out one evening across the bay and fished some weeds for an hour or so until the bugs got too bad. Even though I’m more serious about my fishing these days, I still love to post up on the dock with him and do some casting. It is not a productive method of fishing, but theres something about fishing off the dock with my dad that is special. 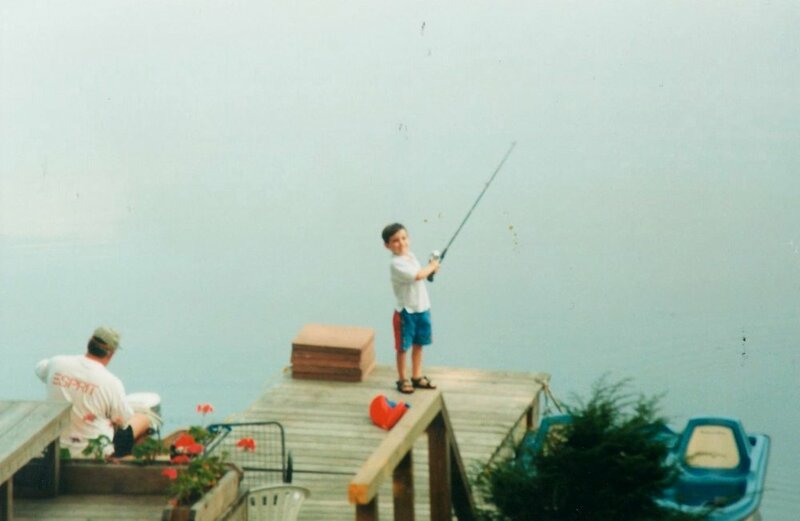 My dad taught me the basics of fishing and has provided me with some of my greatest fishing memories. I couldn’t have asked for a better instructor. I hope one day I’m able to positively influence my children the way he did me. I’m sure he will give me some pointers along the way. I’m looking forward to out fishing him from the dock again this summer. While out shore fishing around a local lake the other day, I came across a family who was fishing from one of the piers. As I walked down the pier to join them, I got a closer look at the rods they were using and I was blown away. Of the 10 of them that were casting, 8 of them were using heavy rods with reels that you would normally find on Lake Ontario for salmon. The rods were paired with what looked like heavy line and very large egg sinkers with a hook and a worm. They also had a net that was suited for the type of musky you find in Northwestern Ontario. I figured with these set ups they must have been trying to catch catfish, although that didn’t make much sense either because this lake isn’t known to hold many, if any, catfish. There wasn’t much space where they were fishing, so I stayed a little further down the pier. I continued to watch them as I fished and it appeared they were trying to set the hook but all the reeled in was empty hooks. One of the ladies pulled up a couple of small perch, but I don’t think she knew there was a fish on until it got close to the surface. The equipment they were using was way too heavy for the fish in the area, and this made for an extremely frustrating day. They felt the panfish around the pier nibbling at the worms, but couldn’t feel it right away because of the heavy line and rods. Even the lady who caught a couple of them was shocked when she saw a fish on the end of her rod. Panfish are so small and have a soft bite so using rods of this size means they couldn’t feel very much, and when they did it was likely too late. Matching your equipment to the fish you think you will catch is very important. Rods can be expensive, but when you start out fishing one of the first purchases you make should be an all around rod. A light-medium rod is perfect for this and you can find many different makes and models for a good price. This type of rod allows you fish for a wide range of species including panfish, bass, walleye, and even pike. Match that rod with a mid range size line, like 6–8 pound test flurocarbon, and you have a decent all around set up. If the family was using this set up from the pier they would have likely pulled up hooks with fish on the end instead of nothing at all. I saw a similar situation the week before while hiking some trails in a local creek. At this time of year this creek only holds small trout, but this rod was suited for fighting a a mature steelhead in the lake it came from. Talk about bring a gun to a fist fight. I never got a chance to talk to the family about what their intentions were because a storm rolled through before I made it down, but maybe they were just out for a family outing and grabbed whatever rods they had at home. A bad day of fishing is better than a day at the office!